Associate professor: Reiko Satow, Ph.D. Associate professor: Atsuko Yoneda, Ph.D. The physiological processes of cell growth, differentiation, and cell death are critical for maintaining homeostasis in mammalian cells. At the heart of many of these processes is phosphoinositide metabolism, which influences diverse cellular functions, including proliferation, differentiation, apoptosis, fertilization, neuronal functions, and cell motility. In this system, phospholipase C (PLC) triggers the hydrolysis of phosphatidylinositol 4,5-bisphosphate (PI(4,5)P2) to generate two second messengers, namely, inositol 1,4,5-trisphosphate (Ins(1,4,5)P3), and diacylglycerol (DAG). Ins(1,4,5)P3 releases calcium from intracellular stores, and DAG activates protein kinase C (PKC). PI(4,5)P2 also directly regulates various cellular functions, including cytoskeletal remodeling, endocytosis/exocytosis, and channel activity. Imbalances in these phosphoinositides are involved in the pathogenesis of various human diseases. Therefore, precise regulation of the levels of PI(4,5)P2 by PLC or other interconverting enzymes is indispensable for normal cellular functions. In our laboratory, we aimed to understand the regulation of phosphoinositide turnover-mediated cell fates such as proliferation, differentiation, and apoptosis. Using genetic models of mice deficient for PLC-delta-type isozymes, we have shown that phosphoinositide turnover is likely involved in the determination of cell fate. The regulation of phosphoinositides is especially important in tissues with high metabolic turnover, such as skin, colon, hematopoietic cells, and in the developing embryo. Thus, we have chosen to focus on the roles of phosphoinositide turnover in skin, and on diseases such as cancer that are caused by dysregulation of cellular homeostasis. The skin is the largest organ and functions as a barrier against the external environment. The epidermis is the outermost skin layer, and is composed of a stratified epithelium; its structure and barrier function are maintained by a finely tuned balance between keratinocyte proliferation and differentiation. Defects in keratinocyte differentiation that compromise the skin barrier are important features of inflammatory skin diseases such as psoriasis and atopic dermatitis. 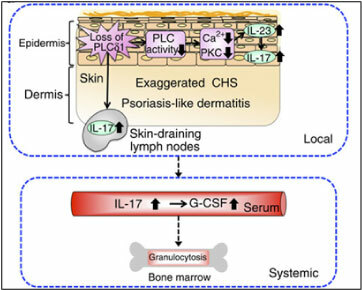 Phosphoinositide metabolism regulates the proliferation and differentiation of keratinocytes, and loss of a phosphoinositide-metabolizing enzyme, PLCδ1, results in a skin inflammation similar to psoriasis and atopic dermatitis. Furthermore, PLCδ1 downregulation was observed in human patients with psoriasis or atopic dermatitis. We are thus trying to understand how loss of PLCδ1 causes skin diseases by utilizing gene-modified animals, human organotypic skin culture, and tissue from patients with skin diseases. Keratinocytes function as an immune barrier by producing antimicrobial peptides and cytokines. Keratinocyte-specific PLCδ1 knockout (KO) mice showed aberrant activation of the IL-23/IL-17 axis in the skin, leading to systemic phenotypes, including an increased number of peripheral blood leukocytes and fever (Nat. Commun 2012). Our finding indicates that the epidermis can act as an endocrine-like organ and that epidermal abnormalities are able to disrupt hematopoietic homeostasis. These findings advance our understanding of human hematopoietic diseases and are likely to inspire new therapeutic strategies. Epithelial-mesenchymal transition (EMT) is an important step for morphogenic processes such as gastrulation and neural crest formation during embryonic development. Tumor cells also undergo EMT, whereby cells lose their epithelial characteristics and gain metastatic capacity, tumorigenicity, and chemoresistance. We have carried out screens to identify EMT-regulating genes or small molecules that restore the expression of E-cadherin, which is a hallmark and regulator of EMT. The screens conducted were as follows: 1. Screening of a library of small molecule compounds 2. 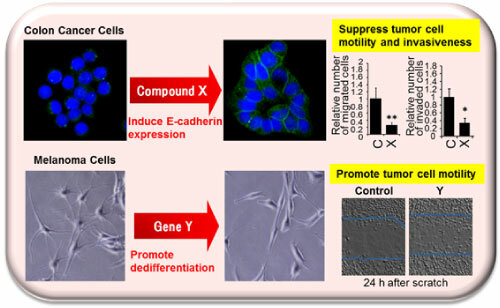 Screening of an siRNA library composed of genes related to the formation of the neural crest Utilizing these screens, we identified compounds and siRNAs that induce E-cadherin expression and reduce tumor cell malignancy. The ultimate aim of our study was the elucidation of molecular mechanisms to facilitate the development of molecular-targeted anti-tumor therapies. Extracellular matrices (ECM) play important roles in modulating the status of the cellular environment under pathophysiological conditions such as wound healing and tumor formation. We aimed to establish an in vitro culture system to recapitulate the tumor microenvironment by co-culture of various cell types, and to investigate whether compromised phospholipid metabolism in those cells affects the microenvironment characteristics. We also aimed to establish technologies that permit modification of the microenvironment. Target molecules include PLC, ECM receptor, integrins, and actin cytoskeleton regulators. Figure. 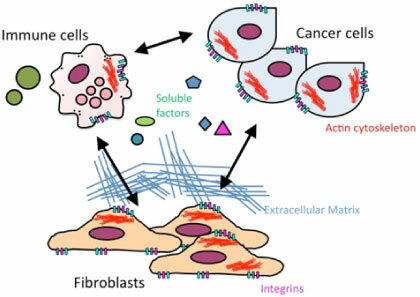 Tumor microenvironment formation is affected by cell-extracellular matrix and/or cell-cell interactions. By compromising phospholipid metabolism in cells in such an environment, we aimed to reveal the mechanisms underpinning microenvironment formation, and to develop strategies for microenvironment modification.